CERTIFIED 1 TEXAS OWNER -- LEATHER & HEATED SEATS -- RUNNING BOARDS -- CLEAN CARFAX! CERTIFIED 1 TEXAS OWNER -- LEATHER & HEATED SEATS -- RUNNING BOARDS -- CLEAN CARFAX! 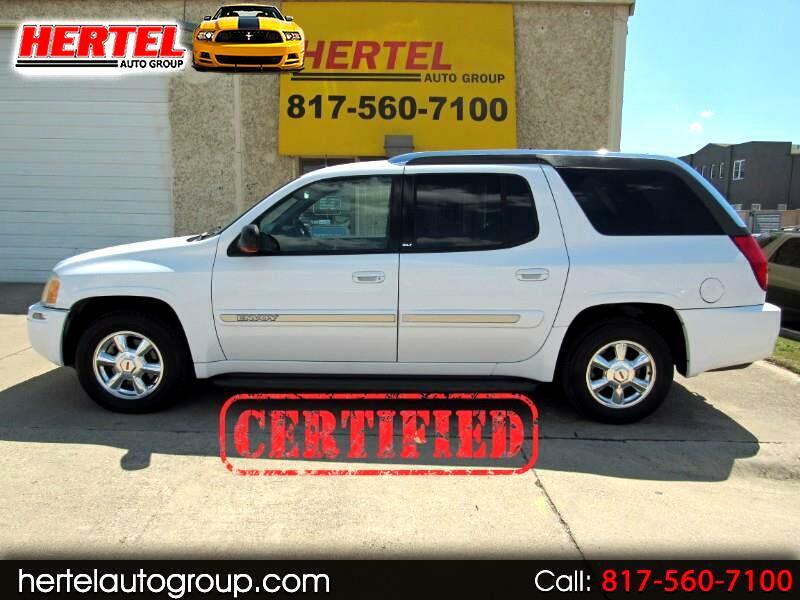 Hertel Auto Group is pleased to offer this very nice and clean, ultra-versatile, well-equipped 2004 GMC Envoy XUV 4x2 SUV for sale in Fort Worth Texas. Bought brand new from Champion Autoplex of Austin Texas in October of 2004, this multi-functional Envoy XUV has spent its entire life right here in the Central and North Texas areas. If you've been searching for a great vehicle for a growing family that also likes to experience the outdoors and set out on new adventures, this would make a great fit for you. As the corporate cousin to the Chevrolet Trailblazer, Buick Rainier - as well the "Imports" Isuzu Ascender and the Saab 9-7, the "Standard" Envoy set itself apart with more upscale styling than some of its relatives. The XUV model - based on the Envoy XL SUV - took utility to a whole new level with the 3rd-row seating area turned into a reconfigurable cargo hold a la the popular Chevrolet Avalanche. But the XUV did it one better by offering a power-sliding rear roof section in addition to its fold-down midgate and all-weather cargo area. With the rear roof opened, the Envoy XUV lets you and your family gaze up to see that the "Stars at night....are big and bright...deep in the heart of Texas!" How's that for some "Don't Mess with Texas" spirit? Equipped with a GM VORTEC 4200 LL8 4.2-Liter Inline 6-cylinder engine, it had original factory specifications of 275 horsepower and 275 lb ft of torque while still returning a good SUV fuel-mileage rating of up to almost 20 mpg on te highway. When properly equipped, it can tow up to 6,400 pounds. That should be plenty of capacity to tow your boot or small trailer. Mechanically, this Envoy XUV starts, runs, drives and performs exactly like you'd expect it to. For additional peace-of-mind, this one is Hertel Certified which means it includes an outstanding 90-Day or 4,500 Mile Warranty that covers far more than just the motor and transmission. All four 245/65R17 tires mounted on upgraded OEM 17" Alloy Wheels are in fair to good condition. Outside, this rust-free GMC's easy-to-care-for Olympic White Paint Scheme is complimented by a Black Leather interior. Inside, the smoke-free interior of this Envoy is nicely equipped with Leather; Heated Front Seats; Memory Driver's Seat; Dual Power Front Seats; Electronic Climate Control; Steering Wheel Controls; Carbon-Fiber-Look Trim; Power Windows, Locks & Mirrors; Cruise Control; CD Audio; A/C; Overhead Console and more. As with any pre-owned vehicle, it does have the usual amount of cosmetic imperfections that are inherent to a vehicle of this age and mileage. We invite you to view all of the photos that are available on our Web Site and determine for yourself if it meets your expectations for a vehicle of this age and price. If it does, we then welcome you to stop by for a viewing and test-drive of this nice and clean 2004 GMC Envoy XUV SLT 4x2 RWD SUV. Given its very low mileage; equipment; ownership history and condition, we've priced it very fairly in the marketplace and expect it to sell quickly. Don't let it pass you by! Please Note: All Prices shown are for Cash (Check) discounted purchases unless otherwise noted. Please contact us directly for vehicle price(s) - if applicable - using other payment methodologies and programs. Visit Hertel Auto Group online at www.HertelAutoGroup.com to see at least 60 pictures of this vehicle or call us at 817-560-7100 today to schedule your test drive. Message: Thought you might be interested in this 2004 GMC Envoy. Certified Plus Coverage includes major components of the Engine and Transmission, as well as A/C Compressor; A/C Condenser; A/C Evaporator; Radiator; Water Pump; Thermostat; Alternator; Starter Motor; Power Steering Pump; and more. Service Work can be done at any Chevrolet / GMC Dealership or ASE-Certified Mechanic. See Dealer for More Details & Upgraded Coverage Options! Warning! Buying a vehicle from Hertel Auto Group will evoke feelings of joy, elation and extreme happiness. Please consult with your doctor to ensure you are ready to experience this much confidence and excitement so quickly. You may also experience envious "ooh's and aah's" from relatives, friends and co-workers when they see how nice your new vehicle is. Purchasing a vehicle from Hertel Auto Group for the first time may also cause uncertainty and confusion if you are prone to expecting the high pressure, games and lack of product knowledge at a typical dealership. Please be assured that these feelings will pass quickly.